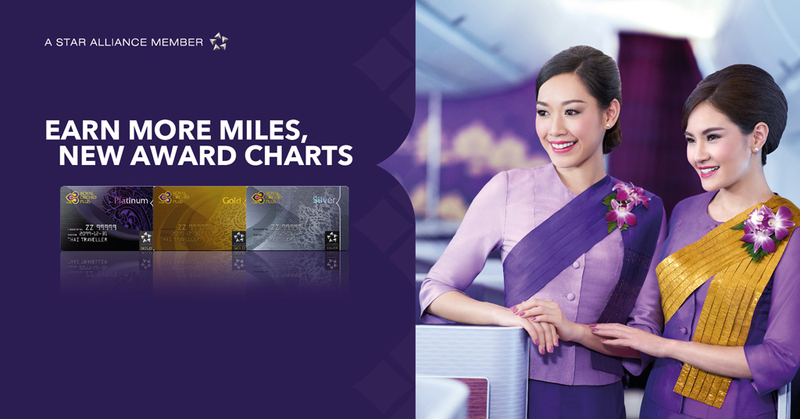 Thai Airways Royal Orchid Plus Improves Earning Structure But Devalues Their Award Chart Effective 01 October 2019, Now Useless For Discount Economy Flyers! 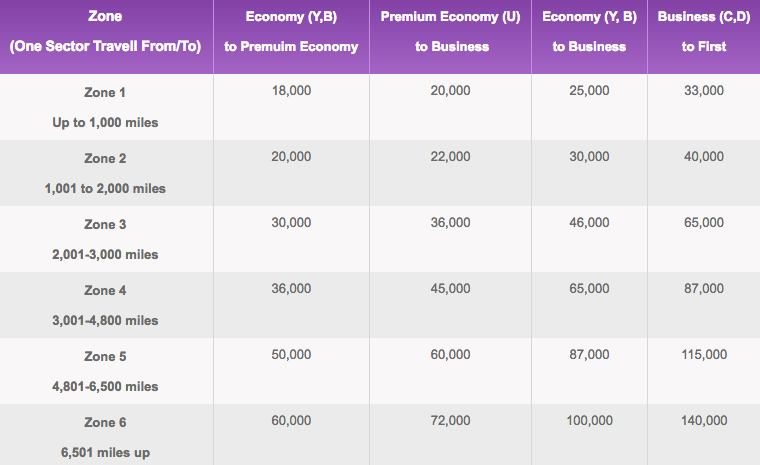 Thai Airways loyalty program Royal Orchid Plus will make substantial changes to their earning and redemption rates as per 01 October 2019 and they might be a deal breaker for many members. While the new earning rates – especially for higher fare classes – are really beneficial the program attractiveness will take a major hit for those who fly Economy Class or collect miles per credit card. Thai Royal Orchid Plus has never been a very profitable program, but if someone could make it to Gold and use the annual 50% off award voucher for a good premium award then it was possible to make it work. Now their new charts are quite absurd and put into question if it’s even worth it to continue unless you’re a First/Business Class flyer (and even for those there are better programs around). Thanks to our reader Sultan from Bangkok who sent us a Facebook message about these new changes. You can access Thai Airways website with the changes here. Commencing 01 October 2019, a number of changes will be introduced that can reward you with more miles and provide more Award flexibility with THAI and Star Alliance partners. The new earning structure provides more miles in many classes of service, depending on the paid fare. Actual miles flown plus class of service miles will continue to be Qualifying Miles that determine Royal Orchid Plus tier status. Having and aspiring to Platinum, Gold and Silver status will be even more rewarding with new Tier Status Bonus Miles earned on international flights operated by THAI and TG 4 digit flight numbers operated by THAI Smile (WE). Tier Status Bonus Miles are earned according to the tier status with each flown qualifying flight. 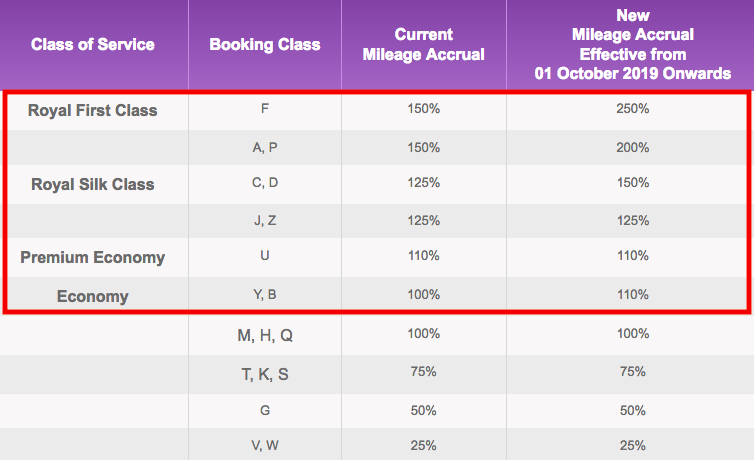 These additional miles are calculated on top of actual miles flown and any applicable class of service bonus miles. So far so good, that sounds great and adjusting the earned mileage up to reasonable levels for premium class flyers makes a lot of sense. 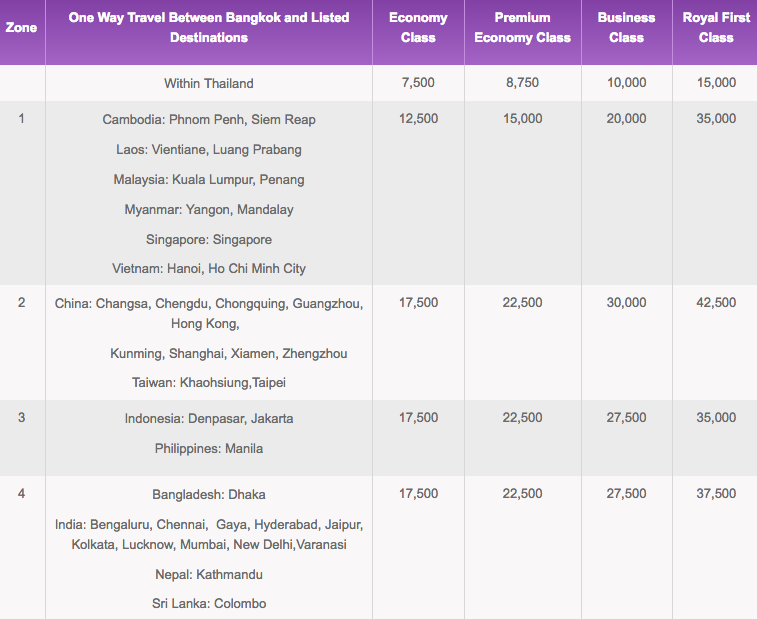 Higher fare classes (full fare) on Thai Airways will now earn substantially more. All others remain practically as they are right now and that’s where the problems start because now Thai tightens the screws on their redemption charts. Mileage requirements have remained the same for many years and in certain zones there are increases in all Award Charts. With the ability to earn more class of service bonus miles and tier bonus miles, this will help to offset Award increases for many members. Changes to mileage accrual and redemption have been designed to continue rewarding and recognizing members, and to align with other leading frequent flyer programs. New Award Charts have been simplified and formatted in geographic zones for ease of use. Mileage requirements are for one way travel, for roundtrip travel simply double the stated miles. New Award Charts are effective for all bookings from 01 October 2019. Current Award Charts and mileage requirements remain available for redemption until 30 September 2019. Award bookings and ticketing can be made online when possible or with THAI reservations worldwide within 30 September 2019 using the current mileage requirements. 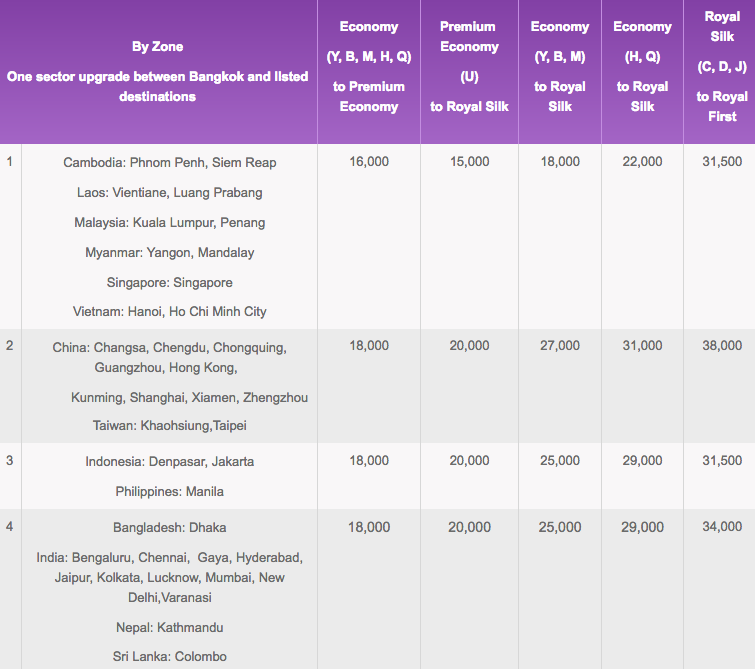 The chart for redeeming Thai Airways awards isn’t great but I guess you can make it work for some zones and depending on how easy you collect ROP miles. Those who fly premium class and have a Thai ROP co-branded credit card obviously collect much faster. A Business Class upgrade to Europe for 94,000 (!!) miles from a rather expensive Y/Q class or First class for 112,500 miles? You must be joking TG! 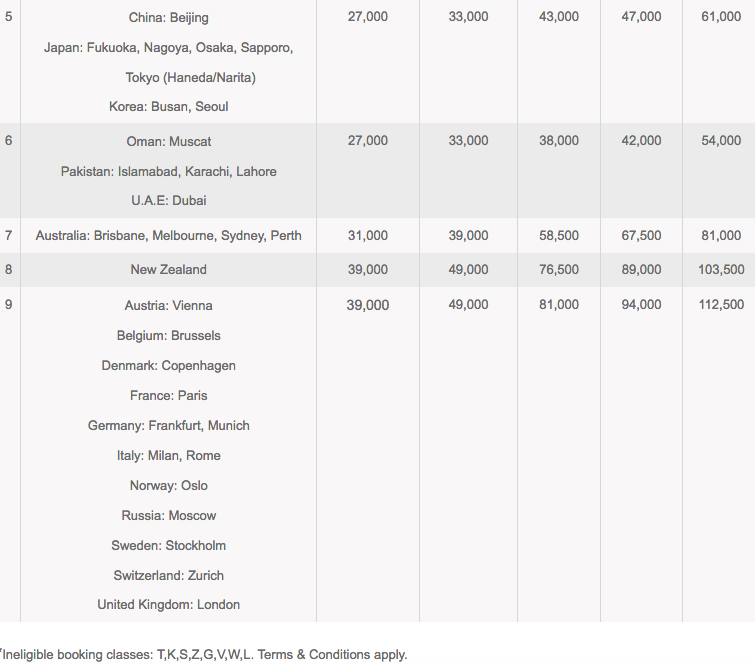 Star Alliance Upgrades do require full fare tickets yet the values are equally bad as the TG tickets that are less restrictive. In the case of First Class Upgrades it’s even worse. The new changes reward customers who book high revenue classes with more miles, which is fair considering the prices involved. The award chart itself needs to be carefully dissected and evaluated considering the members usual travel pattern to determine what redemptions make sense. Specifically those customers who fly discounted Economy Class might find themselves isolated based on the new chart values and should be looking for an alternate mileage program. 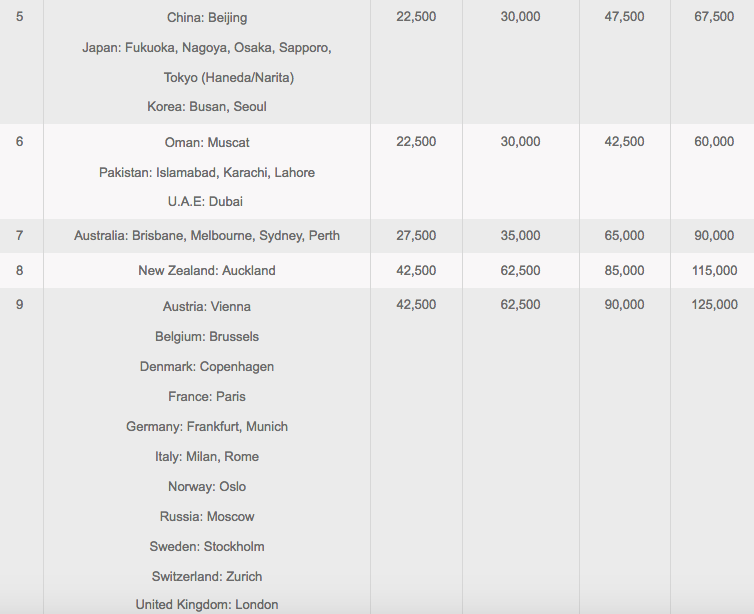 A Business Class round trip from Bangkok to Tokyo for 95,000 miles wouldn’t make any sense at all (ANA Mileage Club sells those for 55,000 miles) but going to Europe for 180,000 rt is very much in line with the competition. The upgrade awards are the real killer here – not worth it at all, they should just as well discontinue them because the prices are out of touch with reality. Previous articleFabulous Fridays: Redeeming Hotel Loyalty Points During Peak Season Dates – Huge Savings Possible!